If we could hear the thoughts of a truckful of chickens on Interstate 80 in Pennsylvania right now, we imagine they would be filled with shouts of the word "FREEDOM!!!!" Crates of chickens blew right out of a trailer carrying them down the highway, giving them what may be their first taste of what it's like to be a flying bird. The chickens are now roaming around the area, according to WNEP News. Police are searching for the escapees, wondering if they crossed the road - not why. 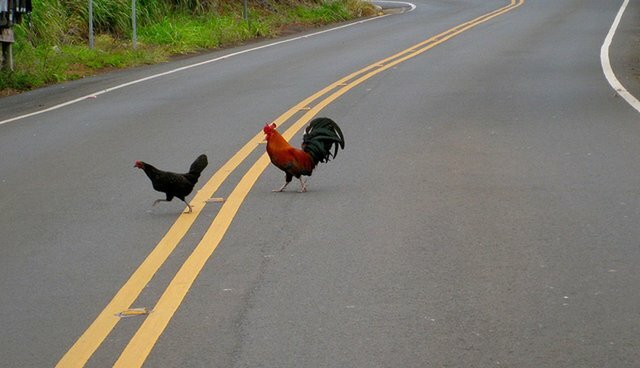 This isn't the first time chickens have escaped their doom, for a moment, at least. Just last December, a truck carrying chickens crashed in Washington, spilling 50 or 60 of the birds onto the street. It reportedly took "a considerable effort" to round them all up. While these birds may be free for now, what awaits them at the slaughterhouse is grim. See this page for more information on factory farming and how to pressure poultry companies to enact stricter animal welfare standards.